A great go bag for any adventure lets you pack it with all your gear and store it so you can bust loose at a moment's notice. One of the biggest challenges with living a modern life is that you’re busy. Everyone is busy, always busy — too busy to have any fun, and certainly too busy to get outside, right? There is a way to gain time, though — all you have to do is start using go bags, a.k.a. gear bags or duffel bags. A great go bag for any adventure — not just for the survivalist bug-out bag fans — lets you pack it with all your gear and store it so you can bust loose at a moment’s notice on the adventure of your choice. Check out the Cabela’s Ripcord lineup. It’s a pretty simple concept, but it’s super powerful, too. Go bags are any duffel bag that will hold the core gear you need to go do an adventure — even at a moment’s notice. For instance, I have a massive olive green Cabela’s duffel bag that holds all my fly fishing gear. 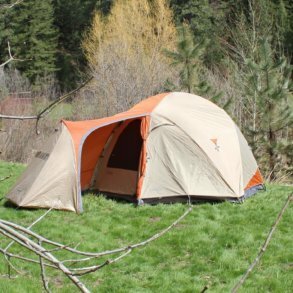 I have my go-to fly fishing rod and reel combo, a backup fly rod, fly fishing waders, wading boots, fly boxes, extra leader, line, and fly gear for buddies who might need something. And yes, it holds my trusty Measure Net — I never leave home without that. The point is, at a moment’s notice, all I have to do is throw this bag into the pickup and I can take off on a fly fishing trip. I’m geared up and ready to go. I have a mesh go bag ready for pickup basketball games. Why mesh? I can see inside it and know it’s stocked, but more importantly, after I stuff it back up with sweaty shirts and socks, the whole bag can breathe until I can get my shirts and socks into the laundry. 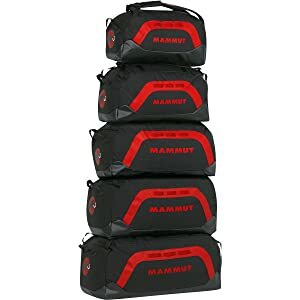 Mammut Cargon Duffle Bag comes in a variety of sizes with removable backpack straps. I have multiple containers packed and ready with various types of hunting gear. I have a backpacking gear shelf with backpacks hanging underneath most of the core gear I take backpacking — for myself and friends and family. I have mini go bags that contain a first-aid kit, and better yet, a survival kit that I can toss into a backpack for a weeklong backpacking trip . . . or even into a daypack for a hike or trip to the river. It also goes into my hunting pack. Your go bags don’t have to be elaborate. Consider this: Taking kids fishing can be a lot easier than you think if you consolidate your gear into a go bag. If you have kids, you probably live close enough to a pond, lake, or river to take them fishing . . . except the thought of finding all the rods, hooks, and getting all of it loaded into the car, along with the kids and snacks . . . it all just adds up to the fact you’re not taking your kids fishing often enough. 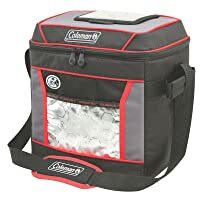 The Coleman 24-Hour 30-Can Cooler makes it easy to load up and go. So what to do? I invested in a few inexpensive telescoping rods that would shrink down and fit into a duffle bag. Next, I went through our “family fishing gear” and got rid of stuff we’ll never use and moved the important lures and sinkers and line into the right sorts of tackle boxes and mini bags. While I still have some older, long fishing rods that will never fit into any go bag, the bulk of our gear can easily be loaded up — from one bag — so we’re ready to go. 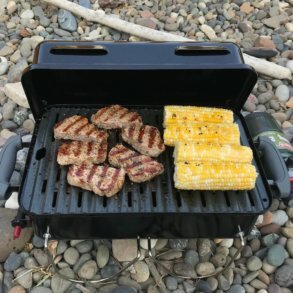 A go bag will remove a road block, and at the very least, smooth out the speed bumps that keep you at home on the couch drinking beer and watching TV. 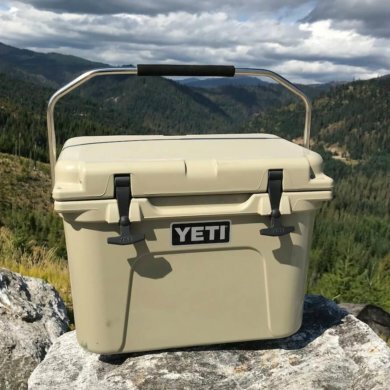 And speaking of beer, an advanced go bag tactic is a cooler system that’s ready for sandwiches and snacks, and better yet, cold beer. If you keep the core food you need on hand — with containers that fit into your vehicle and life — you’ll be ready to jet out the door with little notice. It frees you up. It creates time. Go bags. Start organizing your adventurous life around them. The Cabela’s Ripcord Duffel comes in many sizes, colors, and is durable. One of our favorite best-buy duffel bags. Cabela’s Ripcord Duffel — these affordable heavy-duty duffle bags come in several sizes, look great, use strong and smooth zippers, plus come in a variety of colors, which can give you a visual clue as to which kind of gear you’ve got stored in your go bag. Load up on them and they’ll last for years and years. 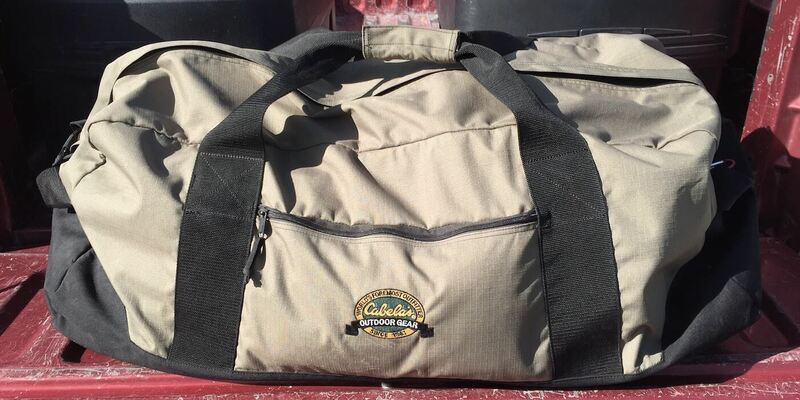 Oh, and the price-to-value ratio of the Cabela’s Ripcord Duffels is fantastic, particularly great when you’re buying multiple bags in sizes and colors to organize your outdoor life. Highly recommended. Northstar Sports 1050HD Ripstop Duffle — one of the best inexpensive go bags we’ve found. Not the toughest, not the best overall features, not even particularly good looking, but the price? Pretty sweet. I use two of the 16″ x 40″ duffel bags to separate the floor from the inflatable portion of an Intex Mariner 4 inflatable raft [review here]. Makes it easy to toss the whole thing in the back of the pickup and hit the road. REI Roadtripper Duffel — it’s roomy, has 600-denier Cordura polyester, wrap-around nylon handles and shoulder strap, traditional round tube design . . . dirt simple and effective. These expedition duffel bags include straps that let you carry them like a backpack — great for the airport, but also great for hauling gear off the beaten path for some out-of-campground tent camping. They won’t replace a real backpack, of course, but for short hauls, they’re fantastic. All of these go bags are expedition quality, too, by the way, and they’re designed to shrug off pretty much everything. The North Face Base Camp Duffel is tough, packed with features, and comes in more than two dozen color combinations. The North Face Base Camp Duffel Bag — this go bag is packed with high-end features, including an end-capped zippered compartment so you can separate wet or dirty gear, plus it has ergonomic shoulder straps, is water resistant, and has compression straps. Patagonia Black Hole Duffel — 900D ripstop polyester with a water-repellant laminate, interior compression straps, two zippered mesh pockets, exterior zip stash pocket, daisy chain for lashing gear, removable shoulder straps . . . and the whole thing stuffs into its own pocket. Arcteryx Carrier Duffel 100 Bag — this big duffel is lightweight and gives you multiple carry options. The ripstop fabric is coated on both sides for water resistance, along with taped seams. The inside is white, making it easy to find clothes or gear. 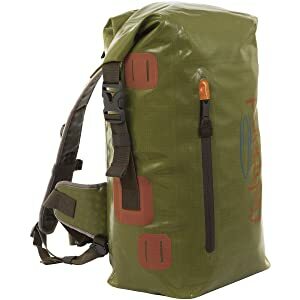 Marmot Long Hauler Duffel Bag — this bag has a laminated shell, ballistic reinforcement, compression straps, haul loops, zippered end pocket, comes in great colors including a sweet green and a sick camo. REI Tech Beast 65L Duffel — aimed more at travel, this bag is loaded with pockets, and all the exterior pockets can be secured with standard travel locks. Mammut Cargon Duffel — ballistic polyester, backpack straps, daisy chain loops . . . all in a basic design that earns your trust and affection. The mammoth logo on the end is just a bonus. The Fishpond Westwater Large Zippered Duffel Bag is about as droolworthy as it gets. Great duffle bags for fishing tend to be tough and waterproof or water-resistant, and some even have separate compartments for wet and dry gear, with mesh to help the wet areas dry out. If you have a 4-piece fly rod, it might be worth making sure you get a bag long enough to fit your rod — or plan on attaching your rod case to the top of your fishing go bag. 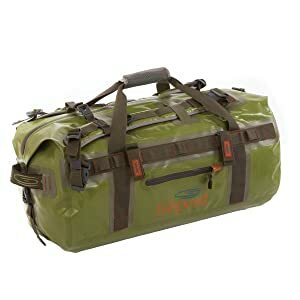 Fishpond Thunderhead Submersible Duffel Bag — this bag is utterly droolworthy, welded together and watertight, and it’s long enough to fit some rods inside, but it also has two sets of rod case straps. Better yet, it has removable backpack straps for when you have to foot it to your destination. It’s a can’t go wrong gift for fly fishing fanatics, too, in case you’re wondering. Simms Dry Creek Duffel Bag — this roll-top waterproof fishing duffel bag is a whopping 48 inches long. It is insanely packable. Alaska, here you come. Simms Dry Creek Duffel Bag — huge, waterproof, and so tough you can throw it around and maybe even use it as a floatation device. Features welded seams, cinch straps, and the clean Simms lines that make fishermen smile. The best waterproof duffle bags are perfect for rafting or boating, obviously, but even if you’re heading out on an epic adventure, you need dry clothes and gear. Obviously the fishing duffel bags above are waterproof, but here’s some more . . . minus the fly fishing features. 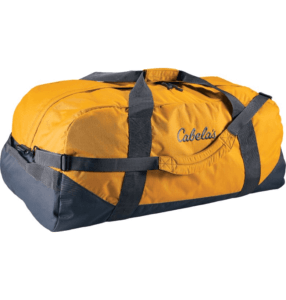 Cabela’s Boundary Waters Duffel Bags — these roll-top waterproof duffel bags are super durable, come in a variety of sizes, and offer a fantastic price-to-value ratio. They’re not super fancy, but damn, they get the job done. I took one to Alaska to fish for coho among the bears, and it’s still going strong. In fact, the Boundary Waters bags are so solid and are such a great form factor that there is little point in mentioning any others when it comes to waterproof go bags. 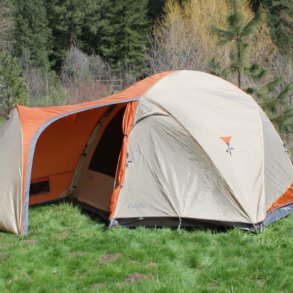 Aqua Quest Mariner 30 — if you’re looking for a dirt-cheap but generally OK waterproof bag — maybe just to shed the rain rather than handle an epic rafting trip — try this. Waterproof backpacks offer some of the best versatility for go bags — think less duffle with straps and more backpack, which means they’ll fit better when you’re on the trail. The Fishpond Westwater Roll Top is a fantastic waterproof backpack. Makes a great gift, too. Phantom Aquatics Walrus 25 — I’ve seen essentially this same bag design from various manufacturers over the years, and it’s always been a decent buy for the money. We trust it for casual waterproof adventures closer to home where it its affordability and multiple color choices just beg you to pick up more than one. SealLine Black Canyon Boundary Backpack — lots of color options, lots of size options, classic lines, and plenty of durability. Great for kayaking and canoeing adventures. 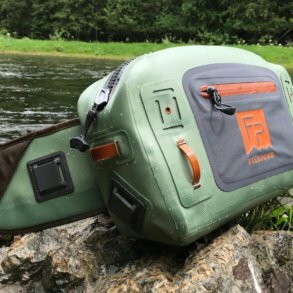 Fishpond Westwater Roll Top Backpack — this is a high-end, waterproof backpack aimed at fly fishers. Padded hip belt, side rod tube attachment. Truly fantastic for fly fishers who like to hike in. Sea to Summit Hydraulic Dry Pack — if you’re expecting constant wetness, get his pack, which is super heavy duty, can handle the cold, plus it has a fully adjustable torso with a padded hip belt. The 90-liter capacity means that you can probably stuff it with more than you can carry. Sure, it’s a specialized sort of go bag, but damn — how can a guy not want this pack? 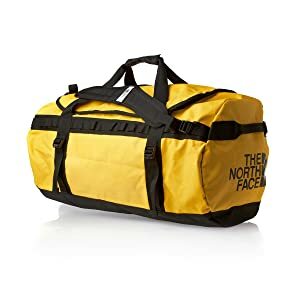 Looking for a Great Duffle Bag at a Screaming Price?